So I built mine a couple of years back.. I was looking on BOLS in the rumor section when they showed the pic of the new one coming out. Did I hit the basic concept they had for it years ago? I'm humbled by this and I hope my conversion had a little something to do with it. That is a gorgeous conversion. The new one is, likewise, pretty damned good looking. Shame that all the rumors seem to claim it's overpriced now. We'll see soon enough, I suppose. As for whether GW was inspired, it's very possible. The guys over there are every bit the gamers that we are, and they probably putter around the internet, too. 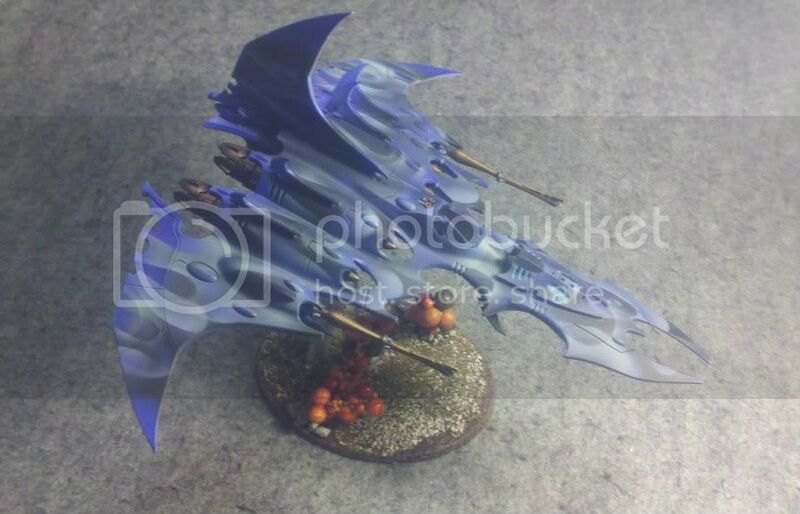 Apart from the clear canopy on the front of the new Void Raven you nailed it with your conversion. It would be nice to think someone at GW saw this and was inspired. I've always liked your conversion, and now I can have my own for a mere £48! I guess you could argue it is a little overpriced, but nevertheless it is cheaper the the 2 Razorwings I would need to buy to copy Dread's homemade version. Thanks guys. I love the new front canopy on it too but doubt I will buy one of the new ones.